This is the typical ocean view seen from Santa Barbara. If you are a romantic, you can pretend the oil rigs are ships on the horizon. 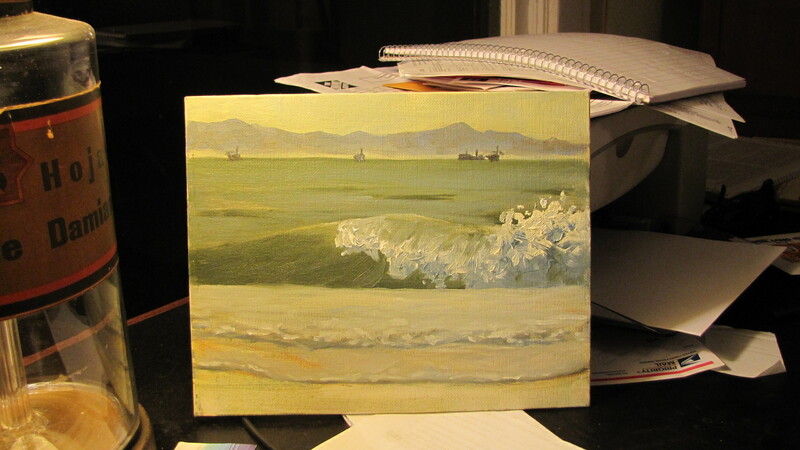 This was a difficult painting because the waves would not stay still for me. It is hard enough to capture a scene painted outside with the wind, bugs, changing light, cloud movement, etc. but to try to paint something that is constantly moving is even more of a challenge. It helps to watch them for awhile to see how they behave. I have also started to try surfing which consists mostly of sitting on a board in freezing water while staring at waves for long periods of time.